The Art & Science Of CSS is FREE to Download! PLEASE NOTE: This offer expired in November 2008 and is no longer valid. Thank you! One of our best-selling CSS books of all time, The Art & Science of CSS (valued at $29.95), is FREE to download for two weeks. 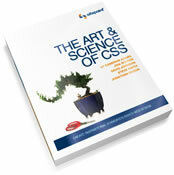 All you need to do to grab a free copy of this awesome CSS book is follow @sitepointdotcom on Twitter. We’re calling it a Twitawayâ€”a Twitter giveaway! It’s only a two-week Twitawayâ€”so don’t miss out, follow us today! We’d like to thank our partners of this giveaway. With their support, weâ€™re able to offer you free stuff like this, so please check them out when you have a chance! Special Twitaway offer — $9.94 off your first month of hosting! Need a logo designed? Visit 99designs.com. Freebies like this are few and far between, so help us spread the word. Tell everyone you think might be interested in a FREE CSS book about this SitePoint Twitaway!